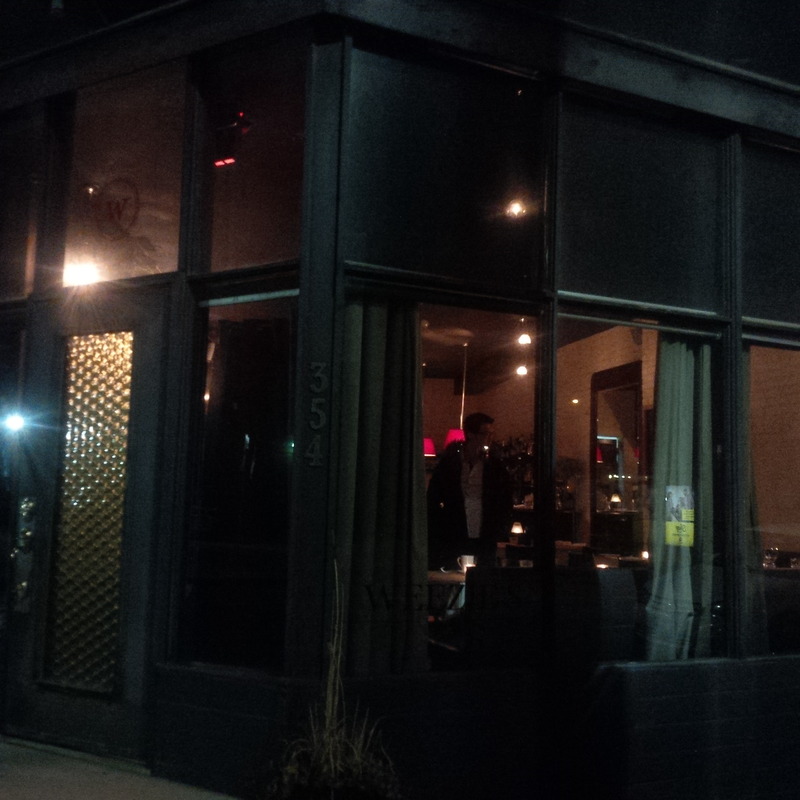 After a much needed spa day we found ourselves both relaxed and and starved in Corktown. It was then that we stumbled across Weezie’s and decided to give a try. Not going to lie – we had hopes of being greeted at the door by Lil Wayne, but we quickly realized that he is “Weezy” and not Weezie…oh well no sizzurp for us. The first thing that we noticed about Weezies, was that it was completely non descript and plain from the outside. Had we not been walking right past, we likely would not have even noticed that it was a restaurant. Weezies is a small, cozy space where it feels almost as if everyone who walks in will know each other. We certainly got the feeling that it was a neighbourhood haunt for locals who were in the know. The lighting was dimmed and there were candles on the tables giving it a very “homey” feeling. Take note fellas, Valentine’s Day is just around the corner and this would be the ideal place for a romantic dinner. There is also a bar in the back corner of the restaurant where you can also enjoy your meal at leisure, as we saw one gentleman doing. The waitress was very down-to-earth and attentive. She answered any questions we had regarding the menu, made great recommendations and laughed along with us (which isn’t hard since we’re hilarious if we do say so ourselves). The food all arrived to our table in a timely manner, which was fantastic considering we were starved. The menu at Weezie’s is quite small and simple. It can be found here. We appreciated that because we love a resto that sticks to what they know they do best. We made some delicious choices. When in doubt and hungry, go with a burger. This was advice recieved by Ash when she just could not make up her mind. Our server recommended the burger and it was no dissapointment, cooked to a perfect medium as per Ash’s request. 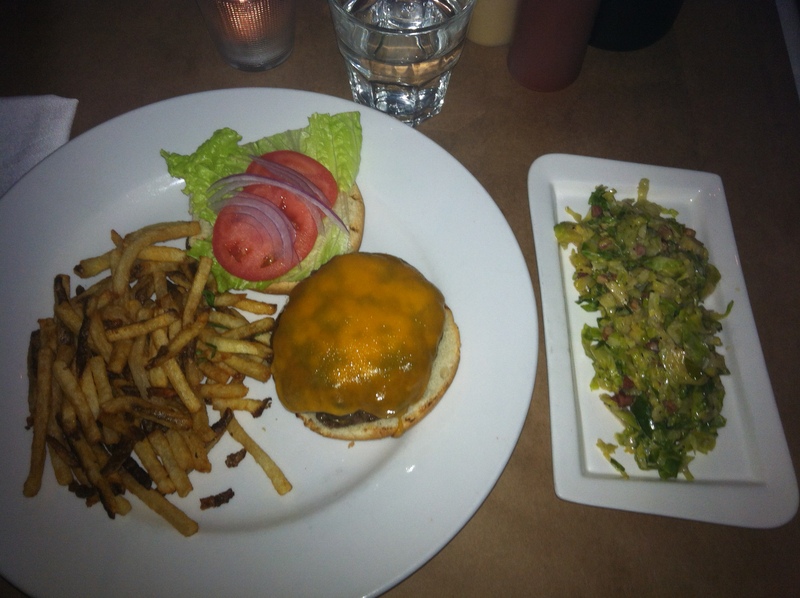 Ash also ordered a side of brussel sprouts , absolutely deliciously prepared with spices and Bacon. 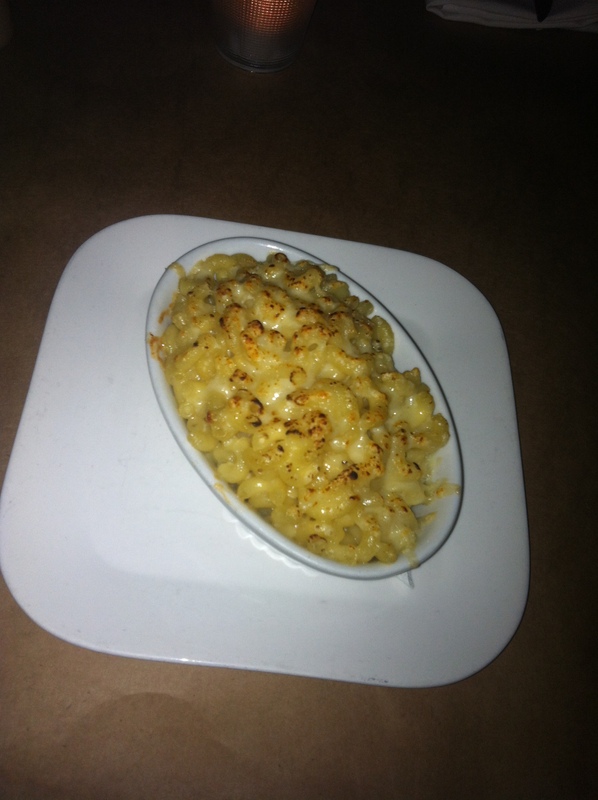 Chris went for a classic mac and cheese prepared with asiago and parmesean. The dish appears on the menu with bacon, but the kitchen prepared it without as requested by Chris. She enjoyed this yummy pasta with a side of frites and garlic aoili. Now stuffed, we just could not say no to dessert. We were intrigued by a creme brulee that was infused with bay leaves. At first we didn’t raise an eye brow at this because we thought the server said it was made with BAILEYS. Big difference. 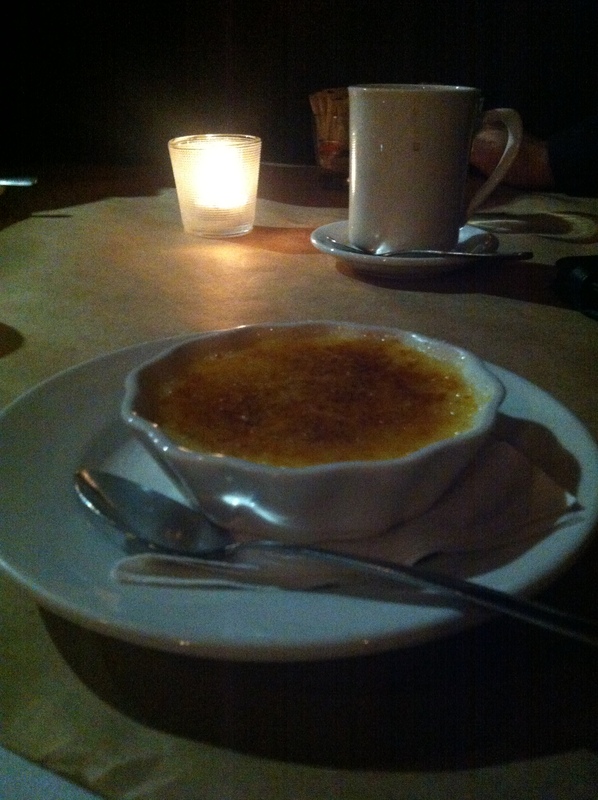 But, surprisingly the bay leaf infused brulee was excellent. Although detectible, the infusion was delicate and complimentary to the sweet and creamy notes of the dessert. It’s a must try. One of the many reason’s that we love our city is that you could just head blindly in any direction and you could find yourself at an incredible gem of a restaurant. We were delightfully suprised to find ourselves at Weezies as it is truly a lovely place with a delicious menu. 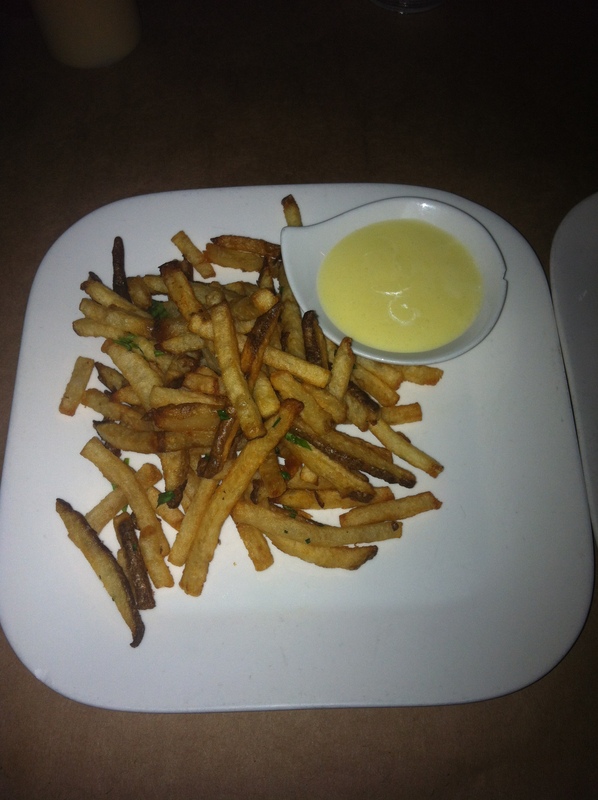 We were very pleased with service, ambiance and the food we sampled at Weezie’s and look forward to returning. Wonderful, I love finding out about these small, intimate places. The food looks great! LOL to the Bay leaves/Bailey’s mixup. That would be some yummy creme brulee, though! haha!